Today every one knows that when you log in to your Facebook account you see a green dot on the left side and below of your right side which lets you know that how many friends are online when you log in to your account. But some time you and your friend may not want to chat with each other at that particular time or you don’t want to chat with any of your friend then what will you do? in Facebook you can control your visibility. If you don’t want that any of your friend see you online you can easily control this, in Facebook you can control or limit your visibility to your friends if you don’t want to be visible to your friends lets see how you can do this. * To limit your chat visibility on Facebook just log in to your Facebook account and go to your chat setting by clicking on the button bellow right side now click Advanced Setting option. 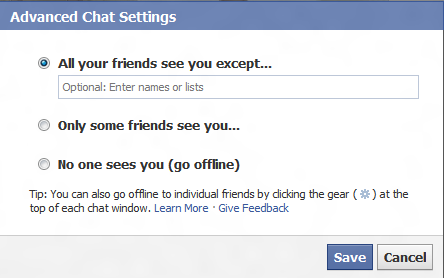 1# All your friends see you except- Here you can enter the name o your Facebook friend you don’t want to appear online. 2# Only some friends can see you- Here you can enter your Facebook friends name you want to appear online and you will be offline to your other friends.